Many companies have invested time and money in backup infrastructures that can use drive-based containers (NAS, SAN, etc.) as a target, but do not support backup to the cloud nor direct the backup to the cloud of the company’s choice. This takes away the advantage of local control and the enterprise choice of cloud vendors. For companies in this situation, backing up their data to the cloud is not an option, because it would require radical and disruptive changes to their entire backup infrastructure. All existing backup software that uses any disk/drive as a target can store data into a Cloud2Drive virtual drive, without requiring any change to any other existing part or configuration. 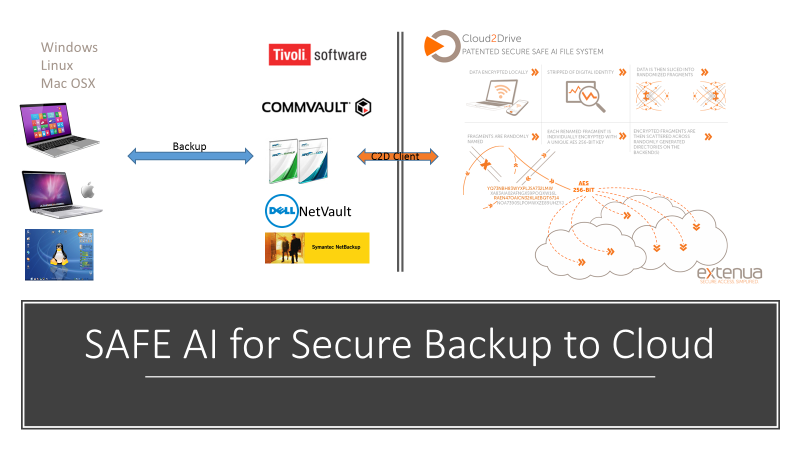 Cloud2Drive becomes the destination for the company’s backups (e.g. : virtual drive Z:) and transparently relays all data to one or many back-end cloud storages, adding strong encryption and high availability in the process. Nothing else needs to be changed; minimal to no impact on existing policies, configurations, options, data flows, deduplication, schemas, etc. Security—Cloud2Drive encrypts data in real time, on the fly during transmission to the cloud storage provider, and at rest, both at the provider and locally, ensuring that third parties cannot make sense of data. Aggregation & Migration—Cloud2Drive enables administrators to aggregate unlimited cloud storage from multiple providers to create virtual drives for backup that scale to fit the needs of any organization. Flexibility—Cloud2Drive is cloud-provider-agnostic, enabling a single virtual drive to use storage from different clouds. Access is unrestricted from any location, eliminating the need for additional hardware VPNs or tokens. Ease of Use—Utilizing the native OS file structure, Cloud2Drive requires no change in user or OS applications behavior. Cloud2Drive appears as a standard network drive. Active Directory —Cloud2Drive incorporates Authme.in for seamless integration of Active Directory. No need to have complicated provisioning outside of AD.